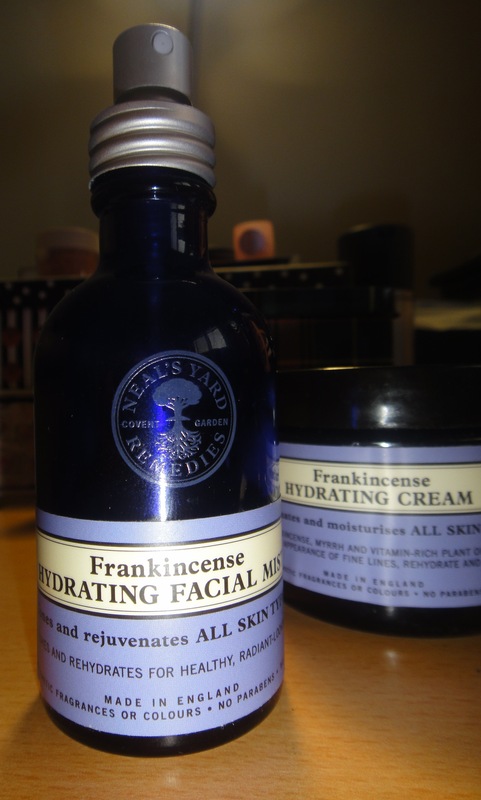 I bought Frankincense Hydrating Mist in a period when my skin felt very dry, it was flakey and irritated. 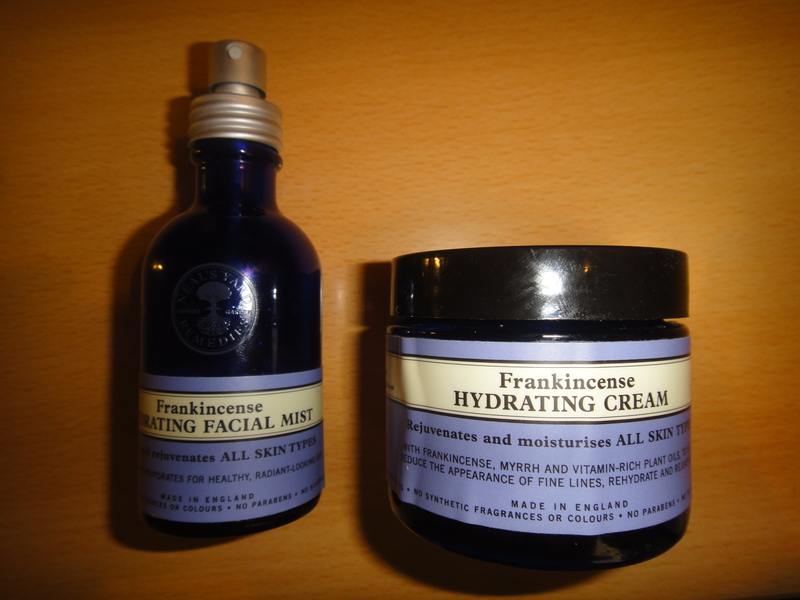 Initially I was going for serum, but the Neal’s Yard assistant suggested me to firstly try the mist. I purchased the product for about 73 dhs, which is around 15 Euro. I have used it as a toner after cleaning my face, I have used it also after my make up application to refresh and seal it and as a hydrating boost throughout very hot days. It leaves the skin glowing and matte but it does not feel tight. On a different note make sure you do not spray close to your eyes. Also, MAC produces a similar product called Fix+, which however cannot beat Frankincense mist. According to Neal’s Yard the Mist is made of 98% organic ingredients. Here is the list of ingredients (taken by the site): Aqua, Glycerin*, Calendula officinalis (Marigold) flower extract*, Alcohol denat. *, Centella asiatica (Gotu kola) extract*, Berberis aquifolium (Mahonia) extract*, Levulinic acid, Glycerin, Aloe barbadensis (Aloe vera) leaf juice powder*, Boswelia carterii (Frankincense) oil, Citrus aurantium amara (Neroli) oil*, Abies alba (Silver fir) oil*, Cinnamomum zeylanicum (Cinnamon) oil*, Pogostemon cablin (Patchouli) oil*, Sodium hyaluronate, Benzyl alcohol, Benzyl benzoate, Cinnamal, Cinnamyl alcohol, Citral, Citronellol, Coumarin, Eugenol, Farnesol, Geraniol, Isoeugenol, Limonene, Linalool. 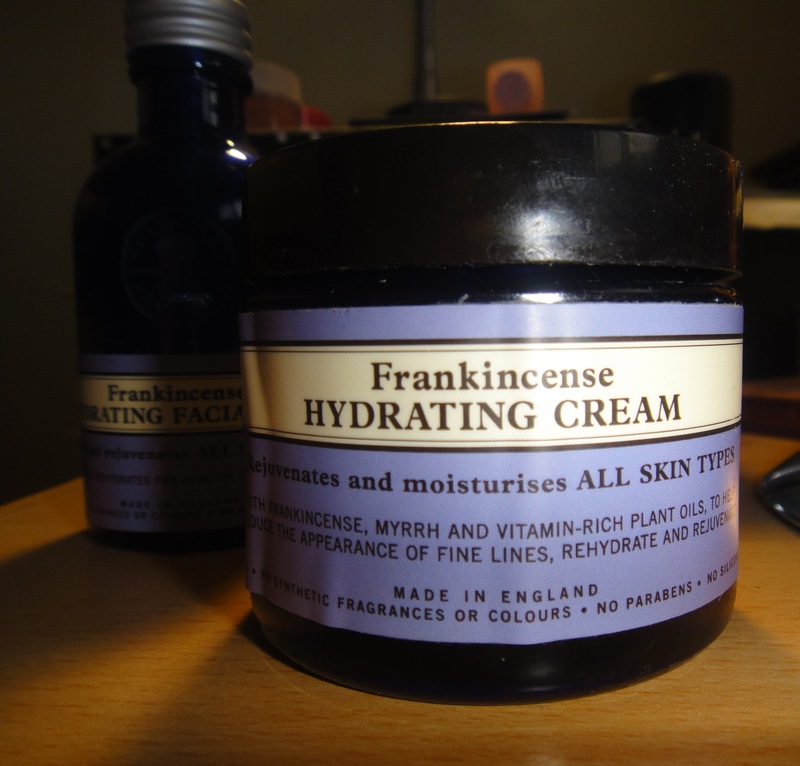 Frankincense Hydrating Cream is a fantastic day cream which hydrates well the skin, without leaving an oily film on it. The cream has a light-medium texture which makes it perfect not only for day,but for night use as well and has a prominent but pleasant myrrh scent. It did not filled my pores, it provided a good base for makeup, but I noticed 1-2 unexpected pimples over the 4 months I used it. What surprised me, is the difference in fine lines’ appearance around my mouth and the expression line between my brows, as the cream softened them. I purchased the cream for 153 dhs. or else 30 Euro. According to the site the cream is made of 91% organic ingredients. Here is the list of ingredients: Aqua (Water), Helianthus annuus (Sunflower) seed oil*, Simmondsia chinensis (Jojoba) seed oil*, Glycerin*, Cetearyl alcohol, Alcohol denat. *, Calendula officinalis (Marigold) flower extract*, Cetearyl glucoside, Prunus amygdalus dulcis (Almond) oil*+, Prunus armeniaca (Apricot) kernel oil*+, Borago officinalis (Borage) seed oil*, Daucus carota (Carrot) fruit oil*, Aloe barbadensis (Aloe vera) leaf juice powder*, Glyceryl stearate, Cetearyl olivate, Sorbitan olivate, Levulinic acid, Glycerin, Tocopherol, Potassium sorbate, Sodium hyaluronate, Boswellia carterii (Frankincense) oil, Commiphora myrrha (Myrhh) oil, Limonene. *Organically produced ingredient. +Nut/Seed-based ingredient. Have you ever tried Organic Skincare products? This entry was tagged Neal's Yard, organic cosmetics, skincare face. Bookmark the permalink.